Rabin, The Last Day, Amos Gitai’s sprawling, scarific two-and-a-half-hour quasi-documentary on the November 1995 assassination of Prime Minister Yitzhak Rabin by a young religious fanatic, Yigal Amir, after the signing of the Oslo Accords, begins by interviewing Rabin’s comrade Shimon Peres regarding the vilification the two men suffered after Oslo: “Sedition was in the air,” Peres says. What follows is brooding aerial footage of a nighttime rally restaged in Kings of Israel—now Rabin—Square in Tel Aviv. The sense of spooky foreboding established by Amit Poznansky’s tense, brooding score is clinched by the sound of three shots and the evocation of chaos—including a recreation of Rabin bleeding to death as his car speeds toward a hospital that has not even been prepped to expect his arrival. A political horror film, Rabin becomes, after this sensational introduction, an investigation. Gitai stages transcripts of the Shamgar Commission of Inquiry convened to trace the chain of events leading to the assassination and discover security lapses that facilitated Rabin’s death. Recreated interviews with witnesses are punctuated with interpolated early (and conflicting) TV reports of the shooting. 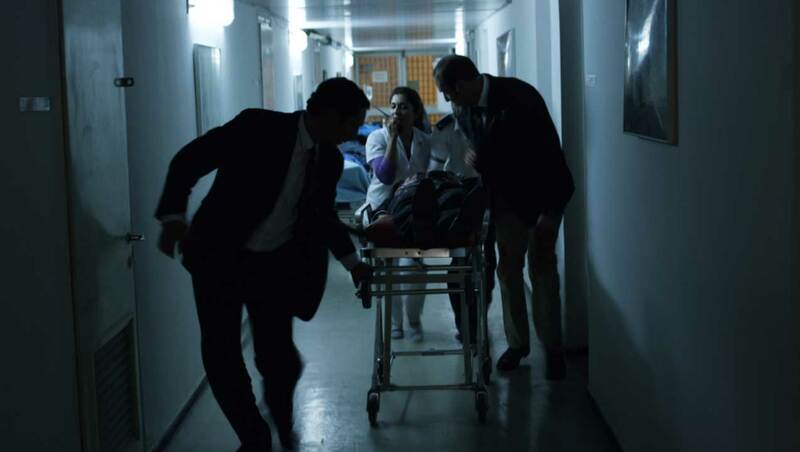 Police interrogation of the assassin (played with scary conviction by Yogev Yefet) is cross-cut with staged shots of the dying Rabin’s arrival at the hospital. To compound the disorientation, Gitai introduces a flashback dramatization of the reading of the Pulsa Dinura (“lashes of fire” in Aramaic), a Haredi rabbinical curse amounting to a ritual fatwa, directed against Rabin. The organizer of this ritual, apparently modeled on the Russian-born extreme rightwing nationalist Avigdor Eskin, explains that the death curse had only been employed once before, against Leon Trotsky (although it has also been applied, if not by Eskin, against archeologists, politicians, and gay activists). There is a further suggestion that the halakhic precept of din rodef (approximately, the right of self-defense) was also used as a justification for assassinating Rabin. More suspects appear. A muttering group of shaggy, bedraggled settlers (all actors) are shown constructing a prefab home on a West Bank hilltop. Meanwhile, crazy Amir gets a prompt at his yeshiva and begins preparations—a real-life Travis Bickle. Flash forward to a lecture, delivered by a Shamgar commission lawyer to one of the commission’s magistrates, on how the West Bank settlements were expanded in violation of international law. Her disquisition segues into video footage of a mass anti-Rabin rally with the real Benyamin Netanyahu haranguing a crowd calling for “blood and fire” and chanting “death to Rabin.” This black mass is followed by a staged scene in which a self-identified psychologist diagnoses Rabin as a schizophrenic Satanist for the edification (and pleasure) of a rabid rabbinical gathering. A videotaped press conference allows Rabin to explain his opposition to unilateral withdrawal from Gaza; meanwhile Netanyahu campaigns for election. In a final staged scene, one of the Shamgar Commisison magistrates walks by posters of self-satisfied Bibi. No need to weep, the heavens supply the rain. Amos Gitai is the most wide-ranging of Israeli filmmakers, the most apparently self-confident, and also the most uneven. Since he first began making documentaries in the 1970s, the 65-year-old director (who, born in Haifa, the son of a Bauhaus architect, lives mainly in Paris) has addressed the subject of displaced Palestinians, the Book of Esther, the legend of the Golem, the status of ultra-Orthodox women in present-day Jerusalem, the exodus of Jewish refugees to Palestine, his parents’ stories, current conditions in Gaza, the lives of “ordinary” Israelis, and more, including adaptations from Arthur Miller, Aharon Appelfeld, and Flavius Josephus. An innovative and provocative documentarian in his early career, Gitai has been at best a mediocre, and at times mesmerizingly bad, director of feature fictions, although, thanks perhaps to the frequency with which his films have been shown in competition in Cannes, he managed to work with a number of A-list art-house actresses, among them Juliette Binoche, Emmanuelle Devos, Samantha Morton, Natalie Portman, Hanna Schygulla, and (twice!) Jeanne Moreau. The Israeli comic Hanna Laslo was named best actress for her performance as a voluble cabdriver in Gitai’s otherwise undistinguished Free Zone, shown at Cannes in 2005, but Gitai’s only other film to receive an award there was Kippur, the 2000 recipient of the Prix François Chalais, an award given by French journalists. Drawing on Gitai’s experience as a reservist, Kippur was the first Israeli fiction film to depict the Yom Kippur War. It is also Gitai strongest and most daring feature—a near anomaly, demonstrating the Polish-Jewish proverb that even a stopped clock is right twice a day. The same might be said of Rabin, the Last Day which, chaotic but compelling, is arguably the most important film of Gitai’s career. Rabin is more incendiary than such obvious precursors as Costa Gavras’ historical melodramas, Oliver Stone’s JFK, and Steven Spielberg’s Munich—and also more insistent on its truth claims. Back in September, New York Times columnist Thomas Friedman recommended the movie sight-unseen for “the warning it offers to those who ignore or rationalize the divisive, bigoted campaigns of Donald Trump and Ben Carson.” To see Rabin, however, is to experience a mixture of helpless rage, mounting impatience, and ontological doubt. Had Gitai wanted to make a movie conjuring the schizoid state—at once panicky and optimistic—that characterized the Israeli body politic during the fall of 1995, he could have readily done so by using the video evidence of Rabin’s vilification. If he planned to dramatize the Shamgar Commission’s bungled investigation he could have straightforwardly stuck with a neutral dramatization of its dismal record. If he wanted to make a fact-based melodrama charging an unholy cabal of right-wing extremists and religious nuts, he should have done that—in fact, he did. As close as my political beliefs may be to Gitai’s and as sympathetic as I am to his analysis, I can’t help but mistrust his filmmaking. Rabin, the Last Day is not only demagogic but self-indulgent in that it seems to place the artist’s personal catharsis above all else. I trust Gitai’s use of the Shamgar Commission transcripts, which he evidently got released specifically for this movie, although I wish they had been more precisely presented, and I’d like to know Gitai’s source for the secret meetings between the “hallucinating rabbis with all sorts of bizarre spells,” as he’s called them, and the various nationalist fanatics. These dramatized scenes are a fantastic spectacle of orthodoxy run amok, but in the absence of footnotes and the presence of some ultra-crazed performances, we might be watching a protocol discussion by the Elders of Zion. Granted, holding movies to rigorous standards of historical veracity is itself unrealistic. Although the motion picture medium’s origins in photography may promote the often-unacknowledged expectation that films depicting historical episodes should be truthful, cinema is an impure hybrid of fact and fiction. Even for documentaries, editorializing elements—from camera placement to imposed chronology—are almost inescapable. Still, Rabin, the Last Day is somewhat less than rigorous in buttressing its argument. Gitai does not exactly advance a conspiracy behind Rabin’s assassination—although he doesn’t rule out the possibility. Rather, he suggests that Rabin’s murder was overdetermined. (If Amir hadn’t shot Rabin, someone else would have.) His interest, he told the NYJFF audience, was in “constructing a mood.” But terror feeds on terror. While the film makes passing reference to the 1994 Hebron massacre where the settler Baruch Goldstein stormed a mosque, killed 29 worshipers, and wounded 125 more—and was extolled by some as a martyr—no mention is made of the Hamas bus bombings during the summer of 1995. (“Obviously I have to leave some space for other filmmakers,” Gitai responded when asked about this.) Surely these events contributed more the prevailing public hysteria and were more catalytic than Eskin’s self-serving claim that his Pulsa Dinura precipitated Rabin’s death. Rabin is strictly Israeli vs. Israeli. Gitai puts a segment of Israeli society—religious fanatics, militant settlers, and, at least by implication, the nation’s current Likud leadership—on trial for complicity in Rabin’s murder. Hence, the importance of sourcing his evidence. “Everything is based on something that was written and said,” Gitai told a questioner. That may be so, but as far as the movie goes, we have only his assurance. Although the filmmaker characterizes his method in terms of investigative reporting, Rabin, the Last Day sacrifices real journalism for the simulation of such—achieving a spurious, and ultimately self-defeating, sense of immediacy. To read more of J. Hoberman’s film criticism for Tablet magazine, click here. From the outset of the NYJFF, the film maker, Amos Gitai expresed disdain against Netanyahu, calling him a cynical leader. Mr. Gitai had clearly a political agenda, to delegitimize the right wing, by pitting them against the left. On my question at the NYJFF night, why the left in Israel did not resurect himself, and are nowhere in sight, in spite of over 20 years since the assassination of Rabin, he reponded: “This is a very complicated question”, so I won’t have time to address it”!? The truth is that presently, the radicalization of the Palestinians and their lack of desire to continue any sorts of negotiations for their own state and no desire to live in peace and recognize the right of Israel to exist, lead the Israelis to re-election of Netanyahu for a record 4th time. At stake, as a front burner is the very essence of the Jewish state, their right to live and exist, which far exceeds the human rights and civil rights of the Israeli Left, which are in the back burner.